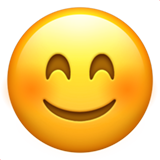 This is how the 😊 Smiling Face With Smiling Eyes emoji appears on Apple iOS 12.2. It may appear differently on other platforms. iOS 12.2 was released on March 25, 2019.